Natural shea butter is manually churned and traditionally extracted with no chemicals. It is whitish or yellowish in colour, silky in texture, and has a distinctive smell. Unrefined shea butter is rich in unsaponifiable matter, essential fatty acids, natural latex, and vitamins A, D, E, F, & K. All the things that one's skin loves! 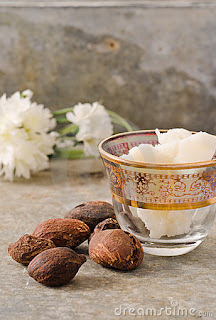 In contrast, refined shea butter is very white with little or no scent, meaning that most of its distinct properties have been lost. Excellent for pets! shea butter is rich in vitamin K; Vetenerians use it as a natural remedy when pets ingest poison. Rule of thumb: If you can’t eat it, don’t put in on your skin. 100% pure unrefined shea butter is naturally extracted from the nut of an edible fruit. For centuries West Africans have used it for cooking and as a lotion. Today, in North America and Europe, it is being used in margarines and as a substitute for cocoa in chocolates. 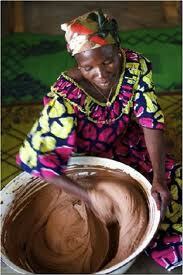 When buying shea butter make sure it's 100% pure unrefined Grade A (Organic & Fair trade-certified). Fair trade breaks the cycle of poverty. It guarantees that women producers are not exploited by offering them a stable purchase price, higher than that of the traditional market! Posted by Shakara Natural Tips at 12:00 p.m.